Yawn, I’m exhausted but I wasn’t able to really sleep last night. I would get to that verge where you know you are about to fall asleep and never fall into that beloved nothingness, rather your eyes pop open. I grab the cell phone and plug in a book on tape – Stacey Keach reading Hemingway… that should do the trick. Nope. I must have has some sleep as I didn’t hear the Muslim temple call to prayers at 5:15 am. The church bells at 6:00 am do wake me. We are up, showered, having breakfast. Breakfast at the Hotel is instant coffee, tea or cocoa, bread/toast, 3 different cereals & milk, fruit, and eggs to order with bacon or sausage. At 8:00 am we meet our head guide, Urio. He says we can call him Oreo since most of his US clients do. He will be getting us going in the right direction today, starting with what will happen tomorrow and throughout the climb: We pack and leave tomorrow at 8:30 am, we have a 3 hour drive to the gate where we register with the Park Rangers. Then another 45 minute drive to the Lemosho gate (this is the route we will be hiking). Then he goes over our daily routine on the climb. But for Today, we are going to walk into town, have lunch, change US dollars into Tanzanian Shillings, shop, buy a phone, and buy bottled water. You do NOT want to drink the local water. You don’t even brush your teeth with it. When we return we have to pack for the climb. It’s Sunday, so not all of the shops are open, but we stop in a few souvenir shops to browse. They are mostly full of batik fabric, baskets, carved wooden items, paintings of animals, jewelry made from beads, and t-shirts. 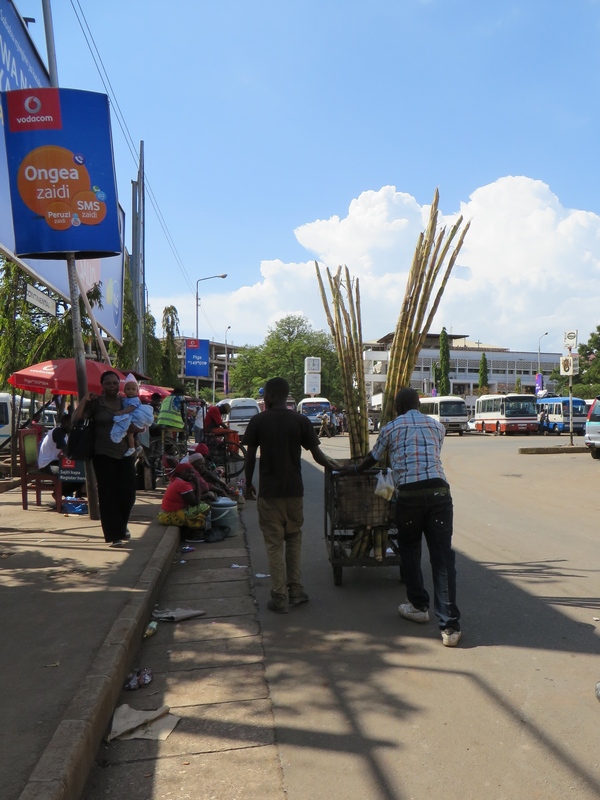 We we get to the heart of Moshi, we find the streets are crowded with people dodging the cars which apparently have the right-of-way. All types of cars, motor cycles, and busses ply the streets which are separated from the sidewalks along the shops by a 3 foot deep “gutter” filled with mud, water and trash. Everyone one lining the sidewalks is selling something; movies, fruits, necklaces, spices, trinkets, t-shirts. It is like a flea market that grew into a town. It seems all the stores sell a mixture of used and new items: groceries, phones, electronics, clothing. And they have all obtained their signs from Coca-Cola: A bright red banner with the coke logo along with the name of the shop in white bold letters, “Sanya Shop”. I ask what a “Sanya” is, and find it is the name of the proprietor – the sign often gives you no clue of what the shop is actually selling. Every shop has bars and gates across the opening. We have lunch at a place called the “Delicious Cafe” which should be a good sign. The menu has many sections: Continental, Grilled, Chinese, Indian, and Italian. No African food. We order (and I’m happy with the very authentic Indian ginger curry chicken) and start to chat with Urio about life in Africa. That is when we learn how to pronounce tan-ZAN-ya like a local. 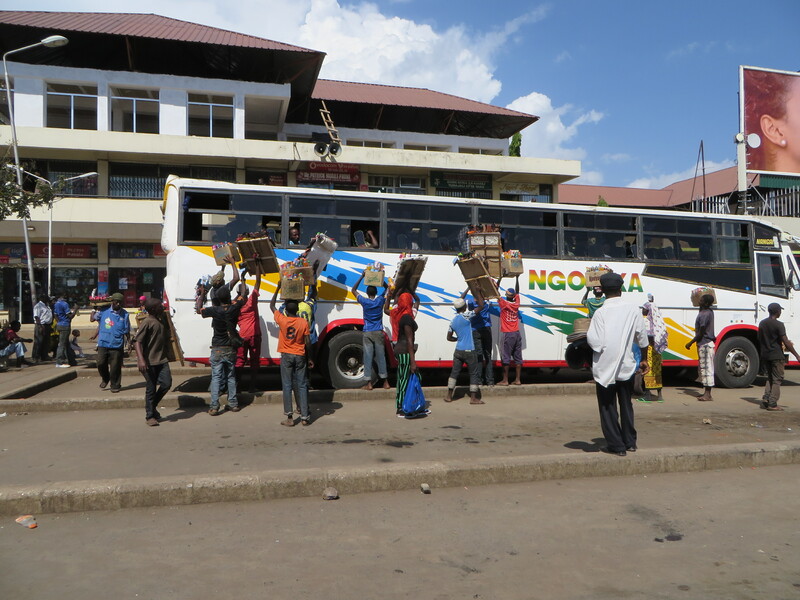 We learn that Moshi is actually one of the bigger cities and one of the cleaner cities in the country. Dar-Es-Salam (the capital) is the largest, and very dirty. 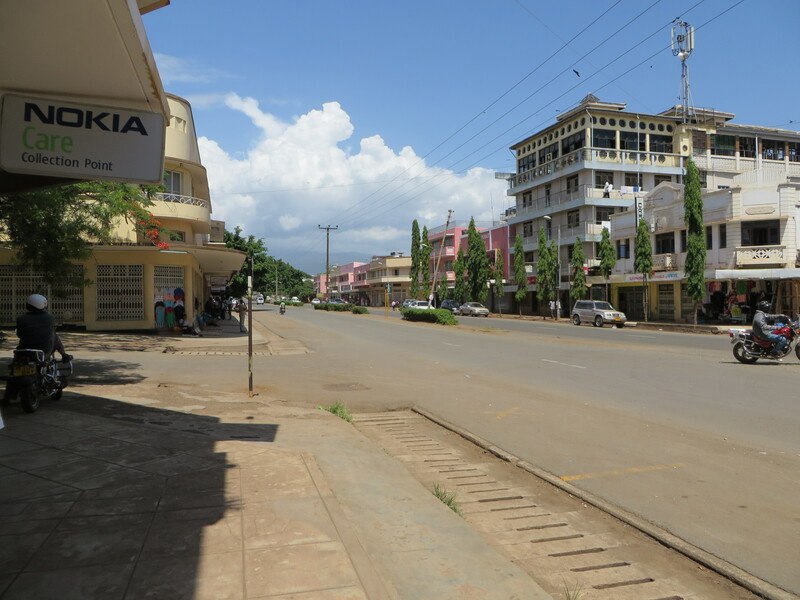 Arusha and a town by lake Victoria are the next largest, but also dirty and you need to be careful due to crime. 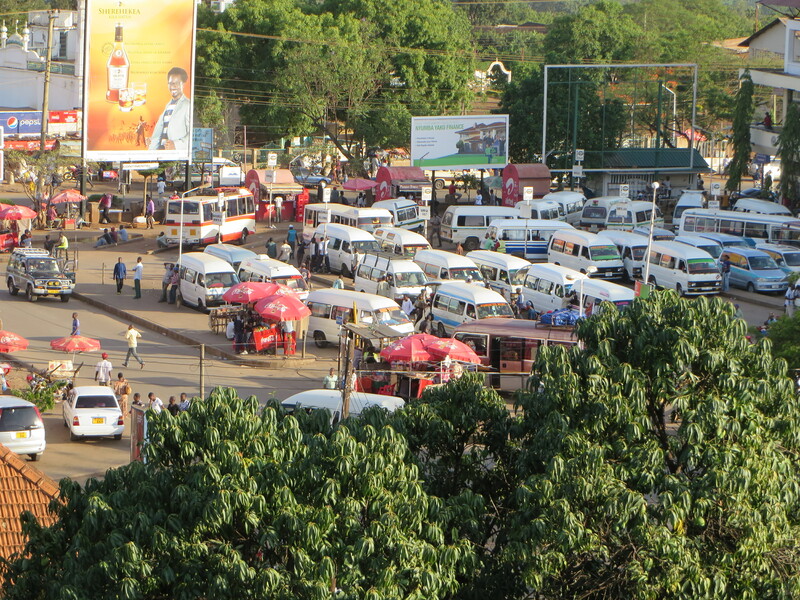 Moshi is growing due to tourism as it is a good starting point for both Safari’s and for the Kilimanjaro climb. We shop for about 2 hours after lunch, obtaining a local phone, some grocery items, and gifts – paintings, carvings, beaded belts and wrist bands, and spices. By the time we return to the cottages, I am hot and tired but the man selling the tanzanite is here and Kerry is shopping for her mom. Luckily we get to sit on the shaded veranda and have a beer while shopping. TIP – I was not going to bring my iPhone, but ended up bringing it anyway because I have books and music loaded and although I couldn’t charge it on the climb – I could everywhere else. I did not purchase a pricey international plan – in fact I turned off all cell data and put it on airplane mode and turned on the Wi-Fi, and every hotel we stayed at had Wi-Fi in the lobby so I was able to face time with anyone. We used that to show Kerry’s mom all the gems she was able to choose from! Dinner rolls around and I realize that we will be eating all the time on this trip. Anyone who chooses to take this trip need not fear of starving. Unless you are extremely picky, and even starve in the US, you will not have a problem with your food choices or abundance. Kerry and I started joking about coming home with an extra 10 lbs on our hips. The INDOITALIANO restaurant is great for Kerry and Joanie’s pizza and for me – I’ll be getting my Indian food cravings all satisfied on this trip!